1. I began with a whole Chicken. It was quite inexpensive at only $ .89 / pound. Wash the Chicken well, and remove the giblets from inside the cavity. Throw out the liver, unless you have another use for it, it doesn't go well in Chicken Soup. Cut the Chicken into fryable sized pieces. Heat the pot to just under high, and add a little vegetable oil to start the chicken frying. 2. Fry the chicken, a few pieces at a time, until it's all been cooked. I" like a stainless steel pot for this because it'll create a better fond. When you set the chicken in to fry, don't worry about it sticking, and don't force it to get it unstuck. It'll tell you when it's ready to be turned. It'll release from the pan. 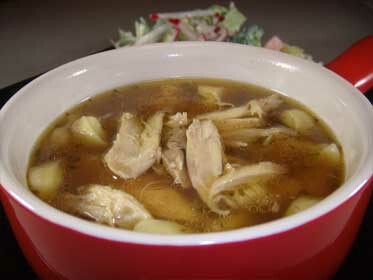 Browning adds both color and flavor to this great Chicken Soup. 3. While the Chicken is browning, cut up the vegetables. I had the small baby carrots in the refrigerator, so I used them instead of larger ones. Leave the skin on the onions, and just quarter them. 4. Set them in the pot, and cook just long enough for them to begin to brown. Pour in about 1 cup, or so, of the broth, and de-glaze the pan. When you've gotten the pan de-glazed, add the rest of the broth, the Chicken, then enough water to cover. 5. Turn the heat to medium, and let it heat to just under a boil. You'll see the foam begin to rise to the surface. Skim this off before the soup boils. Skimming this foam, will result in a clearer soup. 6. Add the parsley, Steakhouse Seasoning Blend, and the smashed Garlic. Let it come to a boil, then turn it down, cover, and let it simmer for about 1 1/2 hours. It's done, whenever the Chicken is cooked through, and falling off the bone. Rather than get a knife dirty to smash the Garlic, I just used the heal of my hand. Take the Chicken out and place it in a bowl to cool. Then remove everything else with a spider. Place all of these solids into a strainer set over a large bowl to drain. Throw out the strained solids..
8. At this point, the Chicken was a little too hot to handle, so I set it into the freezer for about 7 minutes. This cooled it enough where I could handle it, and remove all of the meat from the bones. Strain the soup that was left in the pot, then return it to the pot along with the picked apart Chicken Meat. 9. I cooked dried Tortellini to go along with this, and served it with a Salad with Lemon / Parmesan Salad Dressing.